Officials fear at least 5,000 people may still be missing in Indonesia following a deadly earthquake and tsunami which killed 1,763 people and devastated the northern island of Sulawesi. The country’s disaster agency announced the search for survivors would end Thursday, despite fears that scores of people still remain buried under heaps of rubble and mud. Those not found by Thursday will be presumed dead, a disaster agency spokesman said. Many of the dead were buried in mass graves because of the overwhelming volume of victims. 62,000 people remain displaced as aid donations slowly reach those impacted by the disaster. Officials fear at least 5,000 people may still be missing in Indonesia following a deadly earthquake and tsunami that killed 1,763 people and devastated the northern island of Sulawesi. Officials updated the number of casualties on Sunday. The country’s disaster agency announced the search for survivors would end Thursday, despite fears that scores of people still remain buried under heaps of rubble and mud. Thousands of those still missing are thought to be from the towns of Baleroa and Petobo, which was swept away following the 7.5 magnitude earthquake and subsequent tsunami last month, leaving mass destruction in its wake. Officials are reportedly considering declaring the area mass graves because of the widespread damage. Officials said it was still unsafe to use heavy machinery in some areas where soil had loosened and collapsed after the earthquake in a process known as liquefaction. Many of the dead were buried in mass graves because of the overwhelming amount of victims. Officials have said they worry that a delay in burying the bodies could create a new health crisis. Families have sifted through body bags searching for their loved ones. Many of the missing are believed to be dead as rescue efforts enter its second and final week. 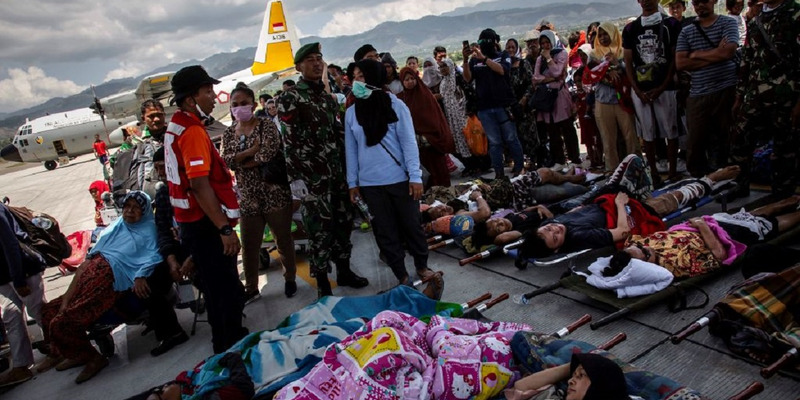 Those not found by Thursday will be presumed dead, disaster agency spokesman Sutopo Purwo Nugroho said. More than 30 bodies were recovered in one place on Saturday. Officials said rescue efforts will now focus on supplying aid and relief to survivors of effected areas. 62,000 people remain displaced, Nugroho said, as aid donations slowly reach those impacted by the disaster. Ulet Ifansasti/Getty ImagesAid deliveries have slowly trickled in. Reports indicate that the country’s early detection warning systems were not working before the tsunami hit. Officials confirmed to the BBC that a network of more than 20 floating detection units connected to underwater sensors which transmit advance tsunami warnings to the Indonesian meteorology and geophysics agency had either been damaged or stolen. The system had not worked since 2012, and an apparent lack of funding hasn’t helped. “If we look at the funding, it has decreased every year,” disaster agency spokesperson Sutopo told local media Sunday. A tsunami warning was still issued, but it appeared to significantly underestimated the scale of the impending waves. Indonesia’s geophysics agency warned of a tsunami nearly 10 feet tall, but lifted the warning shortly after it was issued.